In the process of its production activities, any company that creates a lot of documents to be kept for some, and sometimes quite a long time. It is for this required organization of the files. Create the necessary conditions for storing documents in the archive. First of all, the room should be protected from direct impact of sunlight, level of humidity should not exceed the permissible level, and must be denied access to outsiders. Note that the requirements for the premises of the archive, its placement is not allowed in the wooden buildings, old buildings, buildings with wet grounds, attic or basement. The room is intended for storage of archival documents in the adapted building should be isolated from the rest of the premises, which are located in this building. Also does not accommodate the archive in areas of the building, which are public power organizations that store chemical or flammable chemicals, and food warehouses. Position the institutional archive in a building adapted or built specifically for the storage of documents. The room should be away from dangerous objects under the fire safety. Such, for example, include Parking, gas stations, garages. Also in close proximity to the premises of the archive of the enterprise should not exist objects that pollute the air. Keep in mind when choosing a suitable premises for the organization of the archive, that for the normal operation of the archive requires several separate areas: archive; space for reception of documents; the room for use for the stored documents; a working room for the staff of the archive. Remote archive from laboratory, domestic and industrial premises. At the same time, please note that it does not have a common ventilation ducts with them and were separated from adjacent areas with fire-resistant walls and floors with fire resistance not less than two hours. Also, in the room of the archive exclude the laying of sewer pipes and water supply. 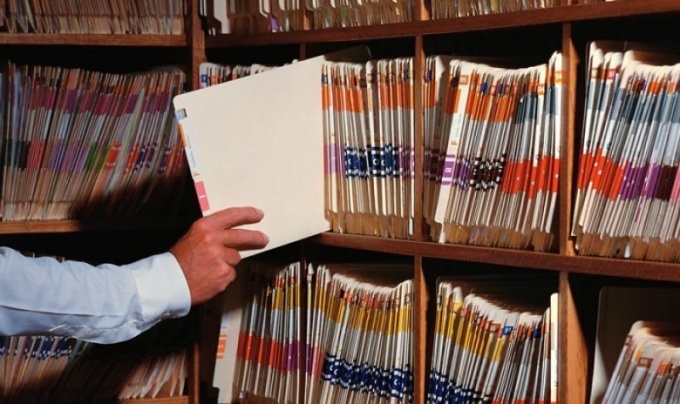 Make enough storage "regulations on custody of documents" and approve it in the head. In addition, the order of the head must be a nominated person who will be responsible for the archive. Also, a special expert Commission, which will conduct periodic examination of documents for compliance with the storage time.